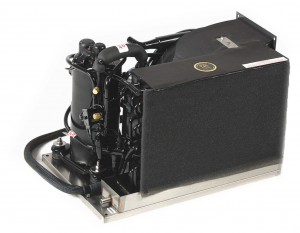 With a cooling capacity of 2,400 cubic feet, our 24,000 BTU unit is designed to cool/heat over 40′ cruisers and over 45′ sailboats. Newest to the Mermaid Manufacturing line is the M24 – 24,000 BTU Cool Only and Cool/Reverse Cycle model marine air conditioners. Due to our customers demands, the M24 was created to solve the problem of locating a self-contained unit where performance, price, and efficiency were hard to find with an output larger than 16,500 BTU’s. Constructed on Mermaid’s standard 304-18awg stainless steel base with dual condensate drains, the M24 is an ideal addition to any vessel looking for maximum performance and durability – all in one package. The M24 is available in Right, Left, and Top air discharge configurations and only comes in 220v. The air output collar holds an eight inch duct. It is recommended to use at least three vents on this unit – minimum sizes of 6 inch vents. As always, the move vents the better. We are able to provide eight inch ducting and air splitters to take eight inch to multiple six inch vents.